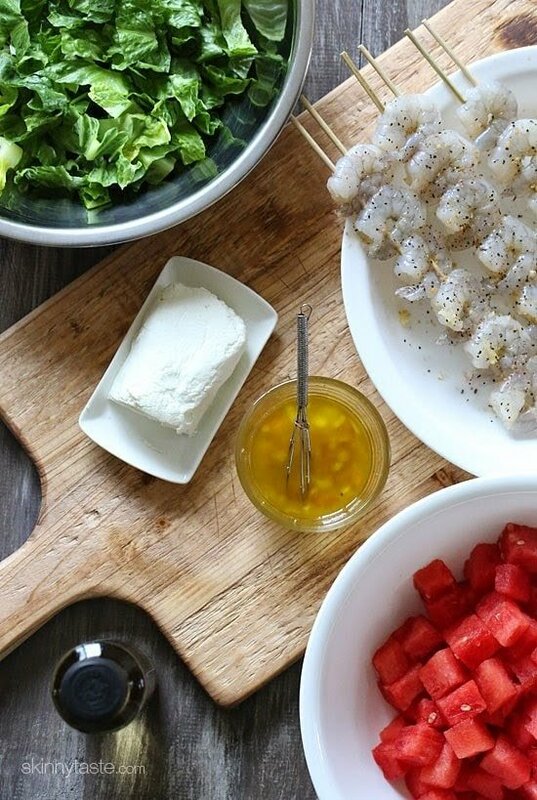 Grilled Shrimp and Watermelon Chopped Salad uses romaine tossed with sweet, juicy watermelon, grilled shrimp and goat cheese with a golden balsamic vinaigrette – I’ll be making this salad all summer!! 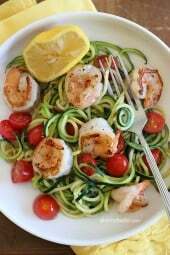 I absolutely love summer salads and grilled seafood lunches! A few of my other favorites are Chicken Waldorf Salad, Grilled Lobster Tails With Herb Garlic Butter, Hamptons Ahi Tuna Watermelon Salad, and Grilled Peach and Watermelon Burrata Salad. I’m so excited to share this recipe with you, it’s so good I plan on making it again for dinner tonight so my husband gets to try it. I put this together in about 20 minutes, so it’s perfect for busy weeknights. The dressing is DEE-LICIOUS, I used DeLallo’s golden balsamic vinegar, which is made from white grapes rather than red and has a sweetly rich taste – it’s fabulous! They sell it at my local supermarket, or you can buy it online, but if you want to use regular balsamic, that would work fine too. I love watermelon in my salad, mostly because I’m not much of a tomato lover. A few weeks ago while in the airport headed to Seaside Fl, I stopped to grab a bite at Marcus Samuelsson’s new restaurant Uptown Brasserie located at the new JFK Delta terminal 4, and ordered a salad just like this. Eating healthier while traveling is getting so much easier these days, a good thing although they also have a Shake Shack which after seeing the calories on the menu, I opted not to try. Hope you enjoy this salad, I’ll be making this one all summer! In a small bowl, combine vinegar, water, shallots, salt and pepper. Gradually add olive oil, stirring until incorporated. For the shrimp: If cooking outside on the grill, soak skewers at least 30 minutes. Season shrimp with seasoned salt, then mix in crushed garlic. grates with oil and grill the shrimp about 1 to 2 minutes on each side. In a large bowl toss the romaine with the dressing. Had all the ingredients on hand. Loved it! So fast easy and delicious. Perfect summer meal. Got your cookbooks too. We had this last night and it was so delicious! I had this dish at a high-end hotel restaurant, and they put toasted pinenuts on the top. Awesome! made this for father, son, and husband, all skeptics. I said I have never made anything from Gina's cookbook or website that wasn't delicious…. they loved it…..and I am making it again tonight! just wondering if you can use other cheeses, besides goat cheese? Pinned this! This looks like a great summer salad. Thanks for sharing. Made this tonight and it was a HUGE hit! We will def be making this all summer long! I encourage anyone to make this salad. The ingredients go so well together, I literally cleaned my plate! One slight thing, I added everything up and came up with 7 PP per serving. Anyone else? We just planted romaine in the garden yesterday … I can't wait to try this with our very own greens! Yum! I've got a watermelon in the fridge – can't wait to try this! 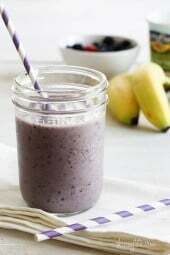 The 293 calories (and other indications) correspond for 1 serving or for 100grammes (3.5 oz) ? Super yummy and healthy! Thanks so much!! I made this today and it was superb! Shrimp, watermelon and cheese. Remarkable combination. Grilled shrimp and watermelon. Hmmm, I might have to try this. It looks filling and gorgeous. I love it. This looks perfect for a light but filling dinner! Just wanted to tell you how thrilled I am that I found your blog. I love your amazing recipies!! Thank you SO much for sharing them. Can't wait to try a bunch of them – and this being said from a non-cook LOL! Blessings!! This looks delicious! I never think about putting watermelon in a salad. Don't know why… but I think this will be the summer to try it! Pinning this!! I'm just now venturing into the world of seafood, which will be great this summer on Long Island! Do you usually buy your shrimp at the seafood counter? I don't know a thing about buying shrimp/fish! 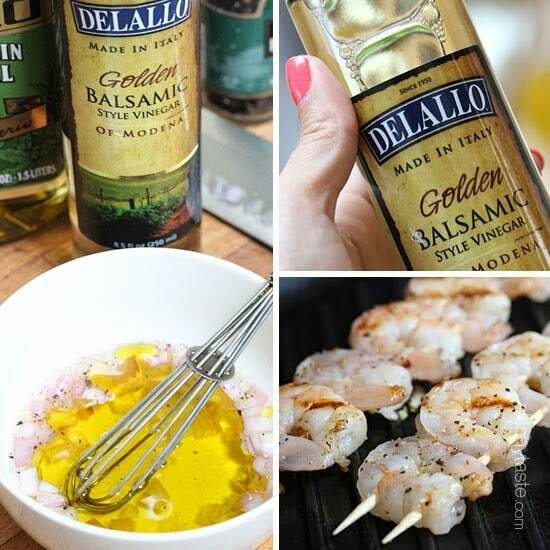 I love DeLallo products and will definitely be on the lookout for this golden balsamic! I'm eager to try this recipe, too! Looks fantastic…great combination! Oh, sorry, but this sounds not good. Probably because I don't like watermelon. This salad looks so tasty! I love watermelon with feta in salad, so I'm sure I'd like it with goat cheese. I think I might add spring onion, for an extra kick of flavor. I came up with 27 points plus for this recipe, which is 7 PP per serving, not 8. Was wondering how you got 8? I can't wait to try this recipe! 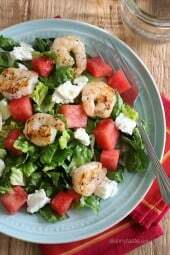 Goat cheese goes so well with watermelon, though I've never tried it with shrimp before. 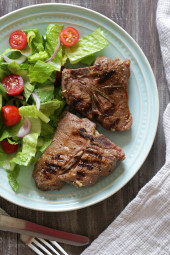 Our website also has a selection of healthy recipes that are great for spring. I definitely can't say no to grilled shrimp! Looks delicious! I also like goat cheese and watermelon. What a great combo! This looks so good! I had something similar to this at a restaurant and the shrimo was a great touch. I can't wait to have it with the goat cheese! Looks like a really good dish, I look forward to trying it. Shrimp and watermelon just sounds like such an amazing combination. It never occurred to me to put grilled shrimp and watermelon together! But it makes so so much sense because they are both amazing summer food. I think I might make this for my next cookout, but I've never had goat cheese… Willing to try it though! The Salad looks amazing, and hope you enjoyed Seaside.. WE love 30A 🙂 super excited for your cookbook! Never thought off mixing watermelon with shrimp but it looks good !